100% nylon Hydra cloth 3000 shell with 100% polyester nylon Ombre embossed 210T taffeta lining, 100% polyester FahrenHot 170 g/m insulation, 100% polyester 250 g/m microfleece liner, and 100% polyester Zap fleece liner lining. 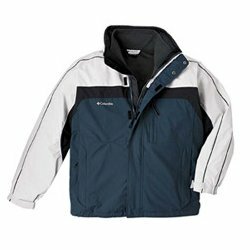 Waterproof with attached hood, underarm vents, radial sleeves and inside pockets. Full-zip with complete interchange compatibility. Columbia logos on the right chest, inside left placket and collar.